The good people at Jameson will be evoking the spirit of the 1920s with a pop-up cinematic speakeasy called the Jameson Apartment this month. Accessed via a secret door on Greek Street in London’s Soho, just off Leicester Square, the Jameson Apartment opens to the public on Wednesday 12 October for the duration of the 55th BFI London Film Festival. 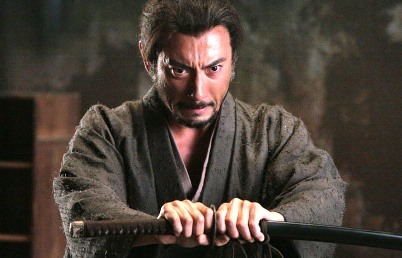 One of the films showing at the Apartment is Takashi Miike’s samurai epic Hara-Kiri: Death of a Samurai (2011) and lo and behold, we have a juicy pair of tickets to giveaway. Edo is peaceful under the shogun, and many former samurai are now unemployed, impoverished ronin. Some, in desperation, approach noble houses and request permission to commit ritual suicide on their premises, secretly hoping to be bought off. The story opens with the ronin Hanshirô (Ebizô Ichikawa) petitioning the House of Li in exactly this way; instead of paying him to go away, the unsympathetic clan lord Kageyu (Kôji Yakusho) recounts the gruesome fate of the last ronin who came with that request, a young man named Motome (Eita). But Hanshiro is actually Motome’s father-in-law, and he has come to the House of Ii to exact revenge. What is the name of the new Steve McQueen film showing at the BFI London Film Festival this month? The Jameson Apartment will be open daily from 12-27 October 2011, from 5.30pm until late and is located at 39 Greek Street, Soho, London. For more information on the Jameson Apartment, including full details of the schedule can be found at jamesoncultfilmclub.com or facebook.com/jamesoncultfilmclub. As a long term supporter of film, including the creation of the Jameson Cult Film Club and sponsorship of the Jameson Empire Awards, Jameson is proud to be the “Official Spirit of the BFI London Film Festival” for the third consecutive year and the official sponsor of the ‘Film on the Square’ screenings – the most anticipated new titles from around the world. For more information visit bfi.org.uk/lff. The competition closes at 6pm on Sunday 9 October, 2011.